Christchurch is a thriving, exciting city on the South Island of New Zealand and is the capital city of the Canterbury region. New Zealand's third-largest city, Christchurch is the only South Island city containing an international airport. Christchurch is home to a truly diverse mixture of tourist attractions, which include historic buildings, beaches with exceptional surfing conditions, numerous shopping districts, world-class restaurants, whale watching, dolphin swimming, and even skiing is possible in the nearby Southern Alps, just a short drive from the city centre. The Christchurch and Canterbury visitors centre resides on Cathedral Square and is packed with tourist information, standing alongside the city's Sightseeing Tours outlet and near the Bank of New Zealand. Located on Victoria Street, the Department of Conservation provides useful information about the national parks on the South Island, while tourism desks are also to be found at the airport terminals, in the nearby suburb of Harewood. Cheap accommodation is becoming increasingly easy to locate in Christchurch, with a growing number of youth hostels being just a short walk away from Cathedral Square, Latimer Square and the Botanic Gardens. There are also more than 100 motels spread around the city, with clusters on Bealey Avenue, Papanui Road and Riccarton Road. The top-end hotels tend to be a little more centrally located, on roads such as Cashel Street, Colombo Street, Hereford Street and Worcester Street, and also next to Hagley Park. More information about Christchurch Hotels and Accommodation. Beaches around Christchurch and Canterbury are plentiful and used for many popular beach activities, such as sunbathing, scuba diving, snorkelling, angling, swimming, and surfing - which has long been a major sport here. 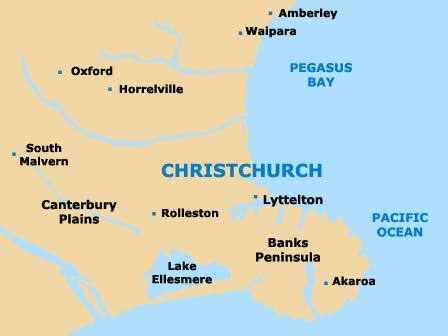 Some of the best beaches around Christchurch are located at Sumners, Redcliffs and along the eastern coastline. Christchurch is home to countless major tourist attractions and some of the most visited include the Christ Church Cathedral - a spectacular Anglican building dating back to 1865; Cathedral Square - the hub of the city, bounded by the 'Four Avenues' of Bealey, Fitzgerald, Moorhouse and Rolleston; Christchurch Pier - on the eastern side of the city, stretching for more than 300 metres / 985 feet into the sea; Christchurch Town Hall - a fairly recent landmark built in the early 1970s; the Avon River - winding through the heart of the city centre, popular for punting; the glorious Botanic Gardens - featuring landscaped gardens, mature trees and important collections of exotic plants; Hagley Park - an enormous parkland, covering over 370 acres / 150 hectares and containing large playing fields; and the University of Canterbury - the largest and most important university on New Zealand's South Island. Other popular tourist attractions in Christchurch include the Jade Stadium - a premier sporting arena regularly holding major rugby tournaments and cricket matches; the Christchurch Gondola - providing cable car rides around the Port Hills, with incredible panoramic views of the cityscape; the Southern Encounter Aquarium (SEA) and Kiwi House - with shark feeding demonstrations, colourful marine fish and a nocturnal kiwi house; the International Antarctic Centre - containing many exciting hands-on exhibits, real snow slopes and snowmobile rides; the Christchurch Tramway - with lovingly restored trams travelling around the city centre; the Discovery Centre - part of the Canterbury museum complex, full of lively interactive activities; Science Alive - with countless child-friendly science exhibits and workshops; and the Orana Wildlife Park - an important conservation park featuring many African animals, particularly popular with children and families visiting this part of New Zealand. 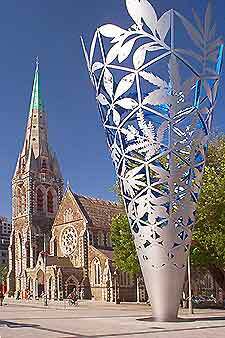 More information about Christchurch Tourist Attractions and Christchurch Landmarks. Christchurch also contains many exceptional museums, providing in-depth information about local history. Major cultural highlights here include the Canterbury Museum - the city's premier museum, with vast exhibition spaces; the Maori and Colonial Museum - on the Banks Peninsula, containing impressive Maori artefacts; the Christchurch Art Gallery - with striking, modern architecture, a large auditorium area and a wealth of paintings; and the highly regarded Galleria Arts Centre - built in 1874 as part of the Canterbury University complex and now housing a number of different art galleries. 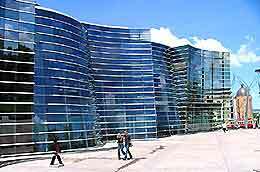 More information about Christchurch Museums and Christchurch Art Galleries. Attractions nearby Christchurch include many districts, suburbs and small towns. 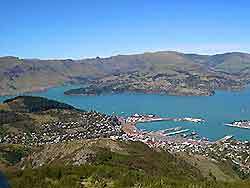 Close by you will find the towns and cities of Lyttelton, the Banks Peninsula, North Canterbury, Central Canterbury and South Canterbury, all home to a vast array of attractions, such as mountains, lakes, glaciers and local museums. Whale watching is now extremely popular around Kaikoura and dolphin swimming is also available here and at the nearby town of Akaroa. Other attractions within easy reach of Christchurch include numerous scenic walking / tramping trails, top skiing resorts in the Southern Alps and on Mount Cook, and a host of vineyards, wineries and breweries in the Waipara Valley and around the Canterbury Plains, West Melton, Burnham and Rolleston - to the south of the city. With sunny weather, fantastic tourist attractions, many heritage buildings, historic landmarks, truly spectacular coastal areas, and plenty of things to see and do, Christchurch understandably attracts visitors from all over Canterbury, New Zealand, Australia and throughout the world.